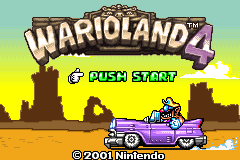 Nintendo GBA Game published 18 years ago by Nintendo of America, Inc.
Wario Land 4 © 2001 Nintendo Co., Ltd.
North American release. Game developed in Japan. See "Wario Land Advance [Model AGB-AWAJ-JPN]" for more information about the game itself. * Wario invades the Game Boy Advance! See Wario in all his greedy glory as he explores vivid worlds made possible by the power of the GBA! * Flex your muscles! Wario is no longer immortal, so you'll have your work cut out as you roll, punch and jump your way to tougher and tougher challenges. Wario will get stung by bees, zombified, bitten by bats, set on fire, and much more - what a way to make a living! * Over twenty enormous stages await! Hunt down CDs for your listening pleasure, or collect treasure to spend on all-new items that you can use against the most bizarre bosses ever! Released on November 19, 2001 in USA.